Khaled Hosseini, The Kite Runner author, on the refugee crisis. KHALED HOSSEINI: Do you know what happened after three-year-old Alan Kurdi's photo went viral? CONTENT WARNING: this post contains graphic images that may be distressing. 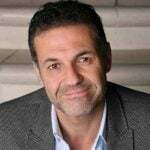 UNHCR Goodwill Ambassador Khaled Hosseini is the multi-award winning author of The Kite Runner and A Thousand Splendid Suns, which together have sold more than 38 million copies worldwide. It is a balmy June morning here in Catania on the eastern coast of Sicily, and I am visiting a small graveyard, joined by an Imam from a nearby mosque. Next door, a few yards away, sits another cemetery: clean, fenced-in grounds and tall, granite headstones, well-watered rows of neatly trimmed rosebushes, a few families paying their respects. But over on this side of the fence, the dead lie nameless. No loving tributes chiselled into marble, no groundskeepers, no flowers. Here the graves are unmarked, neglected mounds, the grass withered, the lot blown through with weeds and trash. The Imam and I sidestep sun-warped orange-soda bottles, balled up cigarette packs, a pigeon carcass rotting in the sun, at the foot of a grave, a frenzy of bees swarming inside the open gore of its chest. Beneath this unkempt earth lie the remains of refugees and migrants who perished in the Mediterranean trying to reach Europe. Many of the bodies, the Imam says, arrived too ravaged for even fingerprinting, their names and histories, the whole of the breathing, dreaming souls they had once been, swallowed forever by the sea. Beneath my feet sleep sons, fathers, mothers and grandchildren, each reduced now to a plot number, a municipality code, a single letter to mark the gender. Because it was impossible to determine religious affiliation, the Imam and a catholic priest were the only two present at the burials, each summoned to recite verses from his own scripture. "They came looking for a more dignified life," the Imam says quietly. "We could not even give them a dignified burial." Leaving the cemetery, I spot something laid atop one of the graves. I stoop down to see, and I am split open. It’s a grimy little ceramic plate, oval-shaped, no bigger than a coffee coaster. On its surface, an apple-cheeked little boy smiles at me, his face a study in innocence. He has light hair and big, bright eyes. Who placed this little plate here, I wonder? Is this actually the boy’s grave, this Plot 2, PM 3900 01, or is he beneath one of the other mounds? And what was his name? I can’t say. 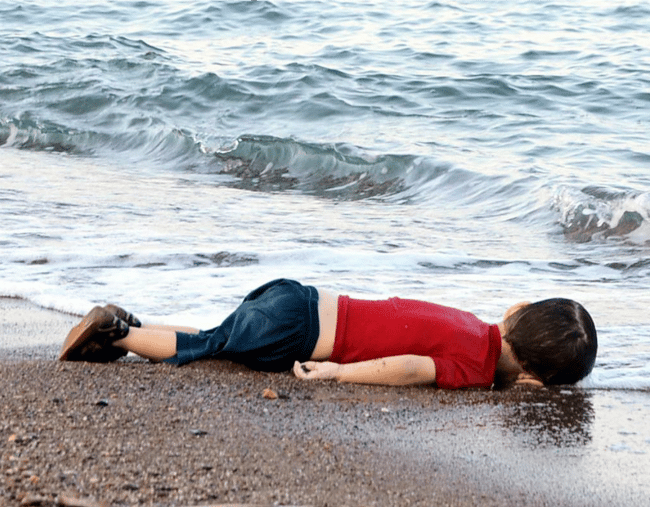 But the name that his face – and the red polo shirt he wears – conjures for me is one that once prickled the conscience of millions: Alan Kurdi, the three-year-old Syrian boy whose body washed up on a Turkish beach in September of 2015, and who in death became a poignant symbol, not only for the brutality of the Syrian war, but for the unfathomable despair that still corners families into crossing the very same waters that swallowed and spat him out. The reality is, sea arrivals in Europe have dropped dramatically since Alan Kurdi’s death. They peaked at over one-million in 2016, but according to UNHCR, the UN Refugee Agency, only 47,000 or so have managed the Mediterranean crossing so far this year. Yet, if anything, public debate in Europe around this issue has escalated, and grown increasingly divisive. In all the noise, the memory of Alan Kurdi’s tragic end has been receding, and with it, alarmingly, so has the collective outrage that gripped the world when photos of his dead body went viral. On June 29th, even as the EU was announcing its new refugee and migrant deal, another rubber boat capsized off the coast of Libya. More than one-hundred people drowned, three of them babies younger than Alan Kurdi. Once more, graphic photos of untimely death circulated online, showing one baby in polka-dotted pants, another wearing Velcro-strapped sneakers, their limp corpses held delicately, solemnly, by members of the Libyan Coast Guard. But over a heartrending, and often heartening, week spent listening to refugees in Lebanon, then Sicily, I stumble time and again into the same thought: I wish the world were a fly on the wall right now. I wish the world could hear what I am hearing. Stories are the best antidotes to the dehumanisation caused by numbers. They remain our greatest teachers of empathy. Each story I hear from a refugee helps me feel, bone-deep, my immutable connection to its teller as a fellow human. I see myself, the people I would give my life for, in every tale I am told. The story of Khadija, for instance, a 31-year-old Afghan mother I meet in a small town in Sicily, where she has lived for the past month in a reception centre with her elderly mother and her two young boys, awaiting asylum. In Kabul, she was persecuted by the Taliban for running a co-ed gym, and had to flee for Turkey after they broke into her home and beat her father to death. After two failed attempts to cross the Mediterranean to Italy -- in hopes of joining family in Switzerland -- the four of them at last found themselves on a crowded small boat, with twenty-three other people and little food or water, this after Khadija spent most of her life savings on the journey and was warned by the smugglers of her poor odds of survival. When she describes the eight terrifying days at sea, tears gather and her voice cracks. "The sea. Imagine how desperate I was," she says in Dari. I understand what she means. Afghanistan is a landlocked country with no water culture. Like most Afghans, Khadija and her family cannot swim. In Pachino, a sleepy town of orchards and farmhouses in the Sicilian province of Syracuse, I sit to speak with a charismatic, eighteen-year-old Liberian boy with a limp in the right leg. He lives in a community centre the locals have generously opened to welcome unaccompanied minors who have arrived in Sicily by sea, many from Eritrea, Gambia, Ivory Coast, Senegal, all of them survivors of a lifetime’s worth of violence and struggle. Ibrahim and I sit under the shade of a canopy, and as his harrowing tale unfolds, I cannot help but picture my seventeen-year-old son, Haris, who is listening nearby, as its protagonist. When Ibrahim describes how he escaped an abusive stepmother and set out on his own, often by foot, across Senegal, Burkina Faso, and Niger, I picture my son crossing those dusty fields, alone and frightened, hungry and exhausted, the horizon of his life no farther than the next sunset. When Ibrahim is kidnapped, twice, by militiamen near the Libyan town of Zawyah, I see my son tossed into the crowded, sweltering holding room Ibrahim describes. I see him, my boy, locked up and starved, terrorised, humiliated, punched, forced to drink his urine, made to endure the stench of dead bodies near him. It is my son’s right leg the gunman’s bullet pierces when he escapes one night, and it is my son who lies shivering in a crowded rubber boat, bleeding from the thigh, praying for his young life as the Mediterranean heaves and roils. "He refuses to speak to his father when he calls from Germany," she says of her five-year-old son, Ziad, who was once so inseparable from Mohammed it was hard to say where he began and his dad ended. She says Ziad is angry. He feels betrayed and abandoned. He is too young to understand the agony behind Mohammed’s choice to leave Lebanon, or how he risked life and limb to give him and his sister a chance at a happier future. Lebanon deserves enormous gratitude for the generosity it has shown Syrian refugees, a population that has grown to over one million today. But 70 per cent of Syrians here, like Ziad’s father, survive on less than $4 a day, and pay high rents to live in old garages, abandoned warehouses, even in unfinished, derelict shopping malls that smell like an open sewer. Refugees here allow themselves little freedom of movement because they fear arrest at checkpoints if they don’t have the right documents. Many Syrian children, like Ziad, don’t attend school, or sit in informal classes that earn them no official certificate. Work is rare, often temporary, restricted to janitorial services, agriculture, or construction, and sometimes exposes the refugee to exploitation by the employer. The cost of healthcare is prohibitively high, even for many local Lebanese. A Syrian refugee with cancer may decide, unthinkably to me, to cross the border back into Syria to receive chemotherapy, then hope he has enough strength for the return trip, provided he is not detained or shot inside Syria on the way back. No one knows better the risks of crossing the Mediterranean than the Captain of the Luigi Dattilo, the second largest ship in the Italian Coast Guard and a veteran of over 100 Search and Rescue (SAR) missions that have saved the lives of nearly 40,000 migrants and refugees. In the briefing room, the captain plays for me a video montage of different SAR missions. I struggle to breathe through the ten-minute film. I see capsized rubber boats, life-jackets strewn in the waters, limbs flailing in the white-capped waves, eyes white with mortal fear, mouths foaming. I see the shocked faces of children, their feet burnt badly from exposure to sun, seawater, and the toxic fuel that pools ankle-high inside rubber boats. As we tour the ship, I try talking to the captain about the current tense climate in the EU around the issue of migrants and refugees. He gives me a knowing glance, a wordless acknowledgement of the gaping disconnect between political rhetoric, public perception, and the reality he finds at sea with every mission. "You have a hard job," I say, lamely stating the obvious. He smiles warmly. "Human life is precious. I wake up every day knowing I may save a few. So you see, I have the most beautiful job in the world." You can donate to Australia for UNHCR’s Syria appeal at www.unrefugees.org.au/emergency-response/syria/. Sea Prayer, published by Bloomsbury, $24.99, is out now.